Fitted carpet in the bathroom was all the rage in back in the 1970s and 1980s – but much less so now. That said, many homeowners quite like the idea of having a soft floor coverings underfoot, particularly when you’re stepping out of the bath or shower. The additional luxury and indulgence this brings is not to be underestimated. What’s more, in homes with small children or elderly relatives, putting fitted carpet in your bathroom may offer additional peace of mind as far as slip and trip hazards are concerned – no more wet and slippery floors means fewer post-bath falls! While you need to think carefully whether you like the idea and the look of a carpeted bathroom, there are certainly plenty of special carpet collections and extensive product choice available to suit any interior bathroom scheme. If you like your creature comforts, a soft, warm and fluffy carpet may just be the perfect finishing touch to a blissful bathroom! Unlike bathmats and scatter rugs, a professionally fitted wall-to-wall carpet is a permanent fixture in the room. This is not an issue in a living room or bedroom, but bathrooms are high moisture environments and need special consideration. If you’re not careful, mould, mildew and bacteria can build up after prolonged exposure, with potentially unpleasant consequences. That’s not to say that you shouldn’t have carpet in your bathroom, it simply means it’s crucial to select a product that is fit for purpose, designed to meet the specific requirements of your bathroom. Bathroom carpets must be stain resistant to cope with everyday wear and tear, and should ideally have a waterproof backing to protect the subfloor from any potential damage. Should the worst happen, a concrete subfloor will be more forgiving than timber floorboards. Choose manmade materials such as 100% nylon, polyester, PTT or polypropylene for your carpet, and avoid natural materials such as wool. Look for low pile carpets that absorb less moisture and dry faster. Carpet squares are a good idea because you can replace individual pieces as required. When it comes to mould and mildew, water is not the only culprit. Interestingly, studies have shown that clean carpets are less prone to developing mould than dirty carpets, even when subjected to the same levels of moisture. Regular carpet cleaning is the best way to keep your bathroom carpet hygienically clean, while helping to prolong its lifespan. 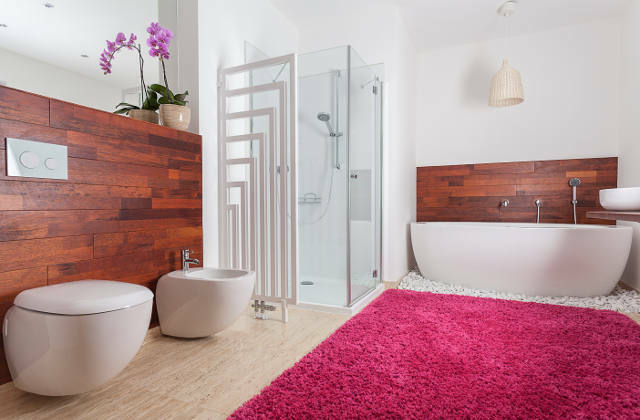 In between professional cleans, place a bathmat on top of your fitted bathroom carpet near baths and showers. That way, there’s an additional protective layer to catch most of the water from anyone stepping out of the bath or shower. For friendly advice on anything to do with carpet cleaning, whether in bathrooms or elsewhere in the home, please feel free to give Apple Clean a call on 0800 587 4571.